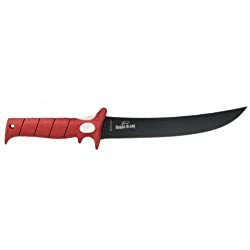 The Bubba Blade 9-inch Flex Fillet knife is usually used for fishes. It is a special tool that is used for handling specific jobs such as filleting and boning fishes. In this review we will look at the opportunity to explore one of the most versatile tool in knives, the Bubba Blade 9-Inch Flex Fillet Knife. Blade: It has a 9 inch blade with a 6 inch handle. Blade Material: The blade is coated with a non-stick surface and made of steel with a Titanium that will help prevent the knife from rusting and pitting as well as let the meat slide off the blade smoothly. Total Length: The total length of the knife is about 15 inches in length. The bubba blade is made from a single piece of steel that provides strength and stability that balances the knife. It has a Teflon coating that will help prevent the knife from rusting and keeps the meat from sticking on the blade. The knife also has trigger grip that lets you have some heat on the knife when needed, as well as a thumb & finger pads to ensure the control over the knife. Furthermore the blade also has safety guards that will protect the blade as well provide protection from the spines of the fish. However there are a few undesirable features, but ignoring them would do injustice with the review. There are some users who would find it to just fillet and bone the fish meat with this knife. Nevertheless, cutting with this knife can possibly reduce the sharpness of the edges within a few months of use. The 9 inch blade is suitable for home and commercial cutting but would not be able to perform an intense task as much as it can. The knife is designed mostly for fishermen or people that likes some flex in their blade, and is an excellent knife for filleting fishes of all sizes. The Bubba Blade 9 Inch Flex Fillet Knife has durability, flexibility, and its performance is worth the prize. The downside with the Bubba Blade 9 Inch Flex Fillet knife is that the Teflon Coating Chips off, and when it is covered with the Velcro sheath, the blade(s) is prone to rust.